Leto first played the Joker in David Ayer’s Suicide Squad, and is set to reprise his role in the sequel, a Joker and Harley Quinn movie with Margot Robbie, and his very own Joker standalone film. Playing Morbius would just be adding another comic book title to his resume. Safe House and Life director Daniel Espinosa will helm Morbius, using a script written by Netflix’s Lost In Space creators Burk Sharpless and Matt Sazama. For those who may not be familiar with the character, Dr. Michael Morbius is a scientist who suffered from a rare blood disease. He had developed an experimental treatment using vampire bats and electric shocks in an attempt to cure his ailment. However, one of the experiments went horribly wrong. And as a result, he was transformed into a vampire who needed to feed on human blood in order to survive. He was first seen as a villain to Spider-Man, but throughout the years, his role has changed and he could be seen assisting the webhead. There was even a time where he headlined his own comic book. It’s pretty clear that Sony intends to see this Spider-Man-less universe all the way through to the end. Whether or not this universe can work without the Spider-Man that brought these characters to life remains to be seen. And Sony’s first crack at spinoffs didn’t even launch thanks to them giving the Amazing Spider-Man franchise the early ax. Those plans included a Sinister Six movie, which was practically shoehorned in and forced down our throats during The Amazing Spider-Man 2. But maybe a Morbius spinoff could work. For one thing, writers and directors are now free to write their own mythology while attempting to stay true to the core elements of the character. Again, that lack of a Spider-Man could end up hurting these spinoffs. But if they garner certain expectations then we could possibly see more of these films in the long run. 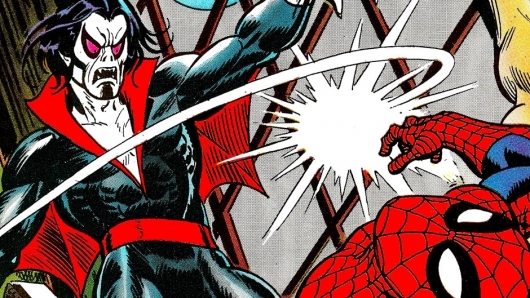 But I honestly cannot imagine anyone begging for a Morbius movie. So let’s hope I am wrong. Whatever happens, just don’t expect to see Your Friendly Neighborhood Spider-Man swinging his way through this universe anytime soon.